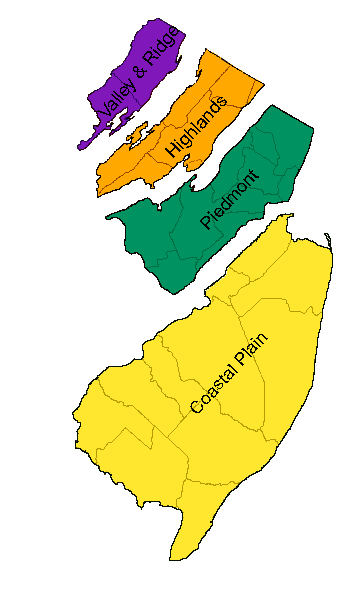 New Jersey is divided into 4 physiographic provinces, the Coastal plain, the Piedmont, the Highlands and the Valley & Ridge province. We have prepared individual checklists for these provinces along with a brief description of their geology. Click on the map or chose from the dropdown box for physiographic data and checklists of dragonflies and damselflies for individual provinces of the state. Data in these checklists is developed from the NJOS database and is updated as revisions appear in print (see bibliography). The authors are interested in learning of additions to the list; please use the Species Report Form to notify us.